I cannot recall how many times I must have said that I am not a ‘Sweets’ kind of person, but this simple cake is something I will be making pretty often! 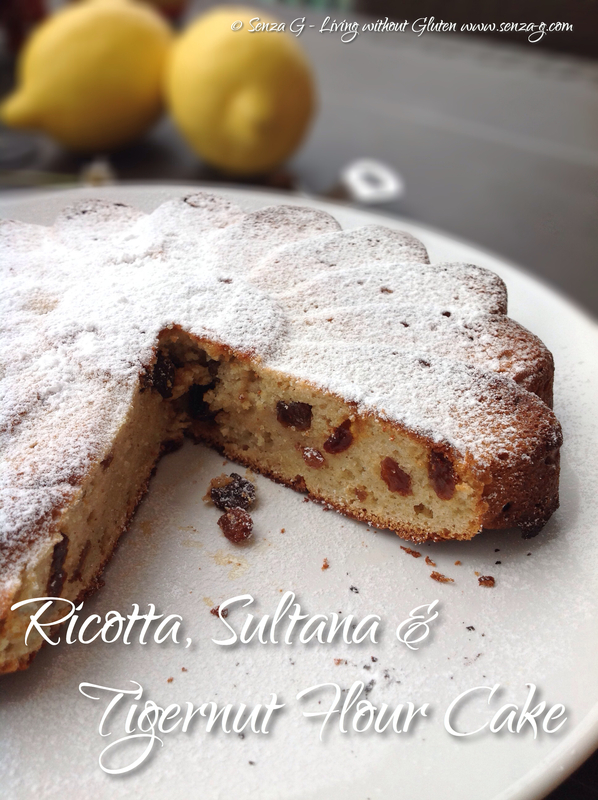 It is adapted from a traditional Italian recipe but I myself have used a blend of plain GF, Almond and Tigernut flour which gives it such a great taste. The ingredients are enough to make a 18 cm cake. I have used a shallow silicon mould. In a medium bowl, beat the eggs with the sugar and the vanilla until light and fluffy. Add the ricotta and grated zest and keep beating. Add the baking powder and Xanthan Gum to the flours and then start adding the flour gradually to the mix, combining well. Throw in the sultanas, mixing them in. Pour the mix into a well grease tart tin or silicon mould. Bake for about 30 minutes on 180C, then lower the temperature to 130C and cook for a further 15 minutes. Leave to cool, invert on a plate and dust with icing sugar.